Every year we gather up all our pumpkins and search for the coolest designs and get to work. 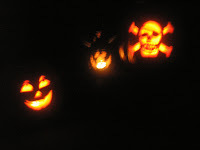 Typically it is Pat and I doing all the work, but the kids love seeing the designs come out on the pumpkins and then the real excitement of lighting them outside. For me, it is all about creating those traditions and memories for the kids. Very soon, they will be able to do the creating and cutting while we sit back and watch the creations come to life. Until then, we are having fun creating the “magic”. 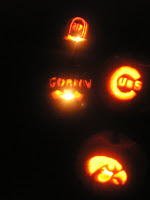 This year we chose to support our favorite teams, The Cubs, The Iowa Hawkeyes, as well as doing our name with a bat and the typical halloween fare of a jack-o-lantern, RIP and pirate skull. Tomorrow the kids will continue with our tradition of trick-or-treating around town with cousins and I will stay home and hand out candy! Then everyone comes back here for food, candy trading, and great fellowship!